Blå Stjärnan Animal Hospital in Gothenburg is Sweden’s largest animal hospital and the most abundant. Each year they receive more than 42.000 patients. The hospital has been around for over 80 years, and they have treated everything from simple diseases to more advanced ones. Blå Stjärnan is active around the clock all year round. Late 2018, Interspectral and Blå Stjärnan signed a deal that included sharing patients CT data. From the hospital’s data, Interspectral create interactive 3D visualizations that empower a new way of learning and studying animal anatomy. Blå Stjärnan uses Inside Explorer as an internal education tool and as a tool for communication with the patient’s owner. The pet owners don’t always understand why a specific surgery must be performed or why the price tag is high, but the collaboration is expected to minimize misunderstandings and increase coherence. A picture from the MyDog exhibition 2019, two veterinarians and two animal enthusiasts exploring “Sune, the cat”. 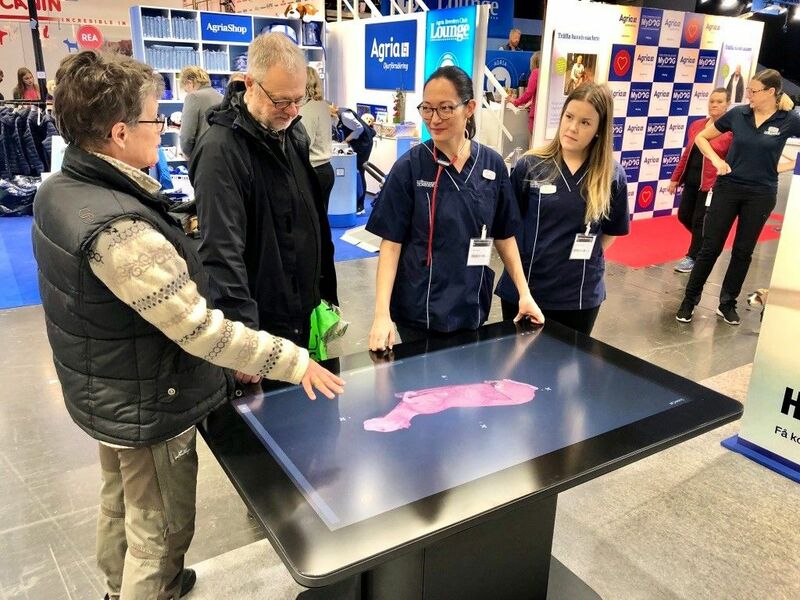 After co-producing a set of clinical cases, Blå Stjärnan and Interspectral participated in an exhibition in Göteborg, where numerous dog enthusiasts, veterinarians and veterinary schools were present. Both professionals and dog owners examined the different data sets and explored the inside of animals. The kids answered questions about the various organs while experts studied the cases of diseases or injuries, such as a brain tumour or less severe injuries. A video over the dataset of Sune the cat. Agreement: Blå Stjärnan shares patients CT-data, information about the clinical cases and knowledge about anatomy.